In line with our policy to keep enhancing SlickPOS, here are the software updates we have released this May. With the new updates you can capture more customer data, support table management, speed up your billing process and support a variety of POS and regular printers. Capture customer details like address, tax numbers etc. Now you can capture additional customer details like shipping address, tax Identifier numbers, secondary phone number etc. You also have the option to create custom fields and choose if the field needs to be printed on the receipt. 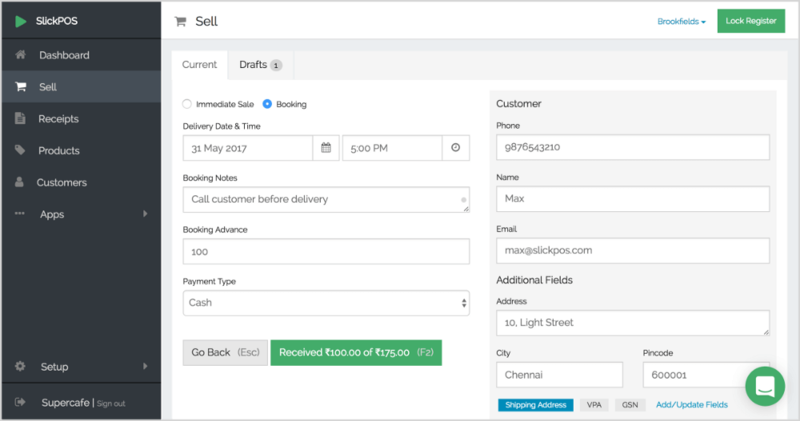 This feature is helpful if you take orders for door delivery and also to print additional customer information on your POS receipts. With this feature, you can provide an optional label when you save a bill as a draft. This is useful in case you want to recollect a drafted bill by customer name or a table name in case run a dine in. We have added a couple of features to receipt printing. First, printing shop logo on the POS receipt; second, choosing the receipt printer size. You can upload your shop logo in the shop setup screen and the print options can be setup from the register screen. Now you can delete cancelled receipts from your POS account. This is helpful in case you made a test receipt and if you don’t want to keep track of it. As before to prevent misuse, receipt delete and cancellations are only available to the store owner and not the cashier. Quick billing in our utmost priority and hence we have added keyboard shortcuts. Now, hitting the F4 key will let you type and choose products, F7 lets you add customer mobile number and F2 confirms the bill. Do checkout the new features and let us know what you think, your feedback will be valued and definitely actioned upon.